You probably noticed a nifty new feature in our latest software update. This is a story about seven brave emoji, how they found their way into ActiveCollab and became ActiveCollab Reactions. Since their creation in 1999 by Japanese artist Shigetaka Kurita, emojis have been an integral part of our everyday communication. Just like their more primitive ancestors - the emoticons - emojis represent a natural, almost universal means of communicating, that transcend language barriers by tapping into our emotions and wide-spread pop-culture norms we immediately recognize and identify with. They’ve had such an impact on the way we perceive emails, texting, and Social Networks interactions, that the Face With Tears of Joy emoji was even chosen as Oxford Dictionaries’ “Word of The Year” in 2015. The reason for this is because our brains have evolved to seek out patterns, even where there are none. That is why, for example, we see a face on the Moon, or think that a chimpanzee grinning must imply that the animal is happy - when, in fact, it is baring its teeth, a clear sign of aggression. This is called anthropomorphism, and it’s in our nature to apply human traits and emotions to objects and phenomena. All this means that emojis occupy a special place in human communication, that, in many ways, predates most modern types of writing. These first forms started out as cave paintings, the ancient art that many speculate served the same function - cutting down on superfluous exposition, to get to pure data. Odds are, cave art is the precursor to the “show, don’t tell” rule. That is why we decided to introduce ActiveCollab Reactions - so we can give you the option to speed up your workflow and make it more fun. As part of our internal vision, we strive to strike that perfect balance between features that enhance work productivity and the ones that make ActiveCollab a more enjoyable workplace. Luckily, Reactions fit both of these criteria. Today’s users expect to be able to use emojis wherever possible. Instead of writing a lengthy comment to let the other person know that you have read and understood their instructions, you can just give it a simple “thumbs up”, summarizing the entire process into one single “Yup, got it!” button click. This way, all participants in the conversation can be kept in the loop at all times and get faster feedback, while reducing time spent on confirmations. It’s similar to how people use Facebook, where they’re often used to indicate (dis)approval of a status, comment, or video someone shared by choosing an appropriate reaction. This adds a much-needed emotional layer to an otherwise faceless application - we can express support, condemnation, sorrow, anger, all in a concise and efficient way. 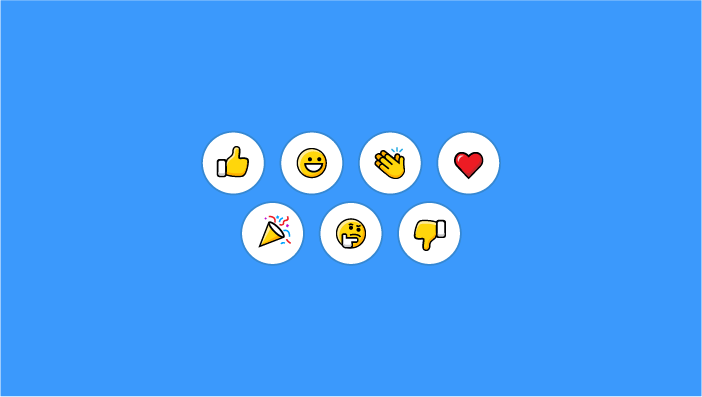 With this new feature, we want to incorporate a range of emotions our users will value and benefit from the most and will expand the way they interact with ActiveCollab. To accomplish this, we read up on consumer psychology, analyzed which symbols and their combinations are used the most in our app, and spoke with outside sources and industry experts. We knew we had to have at least one (the always reliable thumbs up), but apart from that - what is the right amount? Too many, and the flow of information can get impeded by the sheer amount of choices that are slight variations of one another - a cognitive process known as overchoice. Too few, and you can’t accurately express yourself, which can be just as frustrating. Our goal is always to be a part of the solution - never the problem - which is why, after a lot of iteration, back and forth design changes, and re-examining our core principles, we finally came up with our current set of Reactions. These (for now) seven ActiveCollab Reactions are the result of all that effort and planning, and the ones we ultimately chose to include. You can see ActiveCollab Reactions in action if you take a look at this article. We believe this addition to ActiveCollab will prove invaluable to you, our users, and will make your Real Work more enjoyable in the long run. Keep up the Real Work!